This is part of the series of discussions about entity framework. In the last post, we touched the basics about relationship between entities. We discussed how the relational database concepts of different relationship types can be mapped to object oriented entities. We are progressively working on an Institute scenario discussing the various entity framework features. In this post we will be adding on to the previous post by discussing the relationship between entities further. We will discuss how we can define one-to-many relationships. In the previous post we defined a relationship between Departments and Students entities. This relationship was defined such that a student might not belong to a department. 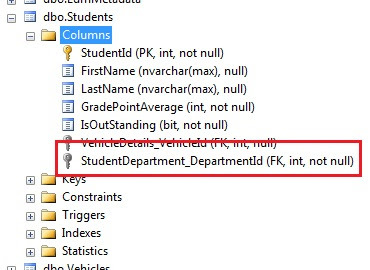 If we look at the database table created, we see that there is a foreign key added in the Students table. It is allowing null values so a student can exist without belonging to any department. In order to change the relationship to one-to-many, we need to specify it when the model is being built. 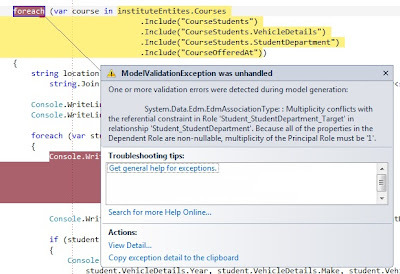 We can do it by overriding OnModelCreating method of InstituteEntities (DbContext). Here we are specifying that it is mandatory for a student to belong to a department. 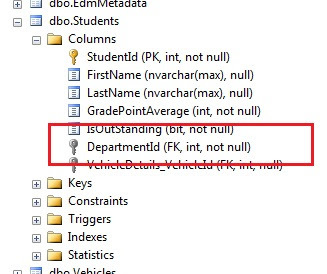 Entity framework would not allow a student to be saved to the database without belonging to a department. 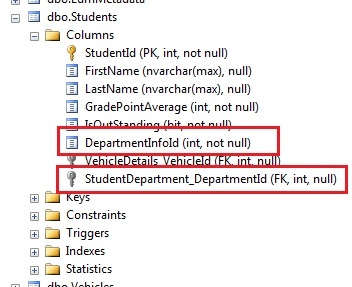 This would result in the following Student's table in the database. 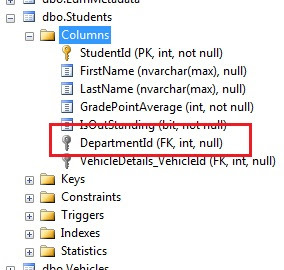 If we had used a name for Department's Id which is not based on convention then the framework obviously would not recognize the significance and would treat that field as just entity's property and would just create a column for the field in the database table. Let us update DepartmentId as DepartmentInfoId. 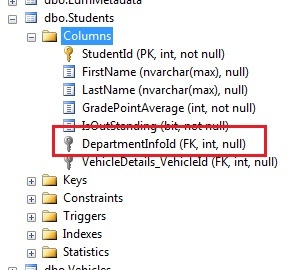 Now the framework would realize that the DepartmentInfoId should be used to define foreign key relationship between Student and Department. 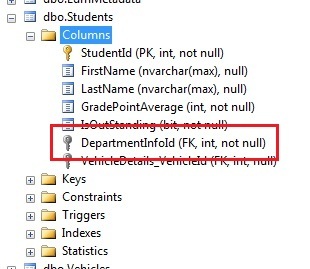 If we had needed a zero-to-many relationship, we would need to update DepartmentInfoId to allow null values. 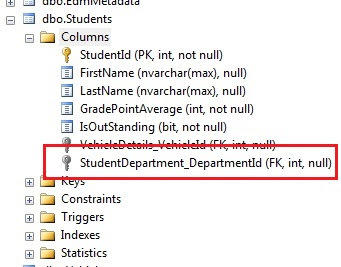 The framework would still use DepartmentInfoId as Foreign key for Department table in Student table. It would just allow null for this allowing zero-to-many relationship. Now we run the application and see it crashing.